If you’re missing one or several teeth, it can feel like your smile is incomplete. Not only do those who are missing teeth tend to be more self-conscious about their smile, they are are also at risk for developing dental health problems down the road such as the loss of bone in the jaw or negatively affected facial structure. Crowns are custom made caps that are designed to fit comfortably over the remaining healthy structure of the tooth. They are often used when there is too much tooth structure that has been damaged and can no longer be restored using a standard filling. Crowns can be made of gold, porcelain or porcelain-fused to metal. Bridges are used to restore the smiles of patients who have one or more teeth completely missing, compared to crowns that go over existing tooth structure. Dental bridges consist of one or more dental crowns that are placed on healthy teeth at either end of the gap left by the missing tooth, and “bridges” the gap with an artificial tooth attached to the crowns. The downside to dental bridges is that to place the crowns that support the bridge, portions of the healthy teeth must be worn down in order for the crowns to fit comfortably. This sacrifice of healthy tooth structure also increases the risk for developing tooth decay, gum problems or root canal problems in the future. Despite these drawbacks, both crowns and bridges are still a very effective tooth restoration solution that will help you maintain a natural-looking smile. For those who are missing a larger number of teeth, dentures are the perfect solution for giving you a functional and natural looking smile. There are several different types of dentures available, which allows Dr. Johnson to better cater to the varying needs of our patients. 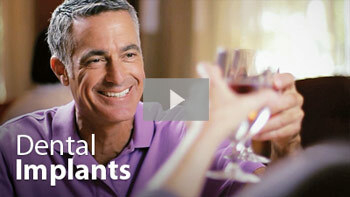 Removable Full Dentures - Full dentures are designed to replace the full set of bottom or top teeth. By making these dentures removable, it offers patients greater flexibility and comfort. Removable Partial Dentures - Partial dentures replace some missing teeth, instead of an entire set like full dentures. These dentures are also removable for ease of cleaning the appliance and your natural teeth to maintain good oral health. Implant-Supported Overdentures - These dentures are held in place by using two dental implants. The implants provide greater stability for the denture, preventing them from slipping out of place when being worn, but the process of getting the implants does take more time compared to other forms of dentures. When you are missing many or all of your teeth, the muscles in your face will start to droop over time and results in a more aged appearance. With dentures, we restore structure to your face and support these muscles, preventing them from drooping. At the same time, wearing dentures can result in bone loss in the jaw, which will also affect your facial structure and dental health over time. A dental implant is a small, screw-like post that is surgically placed into the jawbone, serving as an anchor for a dental crown. The titanium metal material that the implant is made from is designed to seamlessly integrate with the bone in your jaw, resulting in a stable, more natural feeling tooth replacement. Once the implant has fused properly with the bone, a crown is permanently attached to the implant that looks and feels like your natural tooth. When Would A Dental Implant Be Used? Dental implants are good solutions for replacing one tooth, several teeth or an entire arch of teeth. Dental implants not only look, feel and work like natural teeth, but they also help prevent bone loss in the jaw as the implant provides the bone tissue with the stimulation it needs to maintain its integrity. Even though dental implants cost more than other tooth replacement options, they are designed to last a lifetime, making them a good investment in the long-term health and appearance of a smile!